BMW’s E9 series of cars is destined to be a high value future classic. Perhaps it won’t rise to the insane heights of Porsche’s 356 and 911, but it’s a classic shape, and its BMW siblings and Italian cousins (Alfa’s GTV and 2600 coupes) are already rising with the tide. Since E9s were never terribly cheap, always having their E3 sedan cousins to look down at, it’s always a pleasant surprise to find an intact E9 for a reasonable price, even if it is not a runner. And what could possibly go wrong with a non-running 2800CS with some rust in a seaside setting? 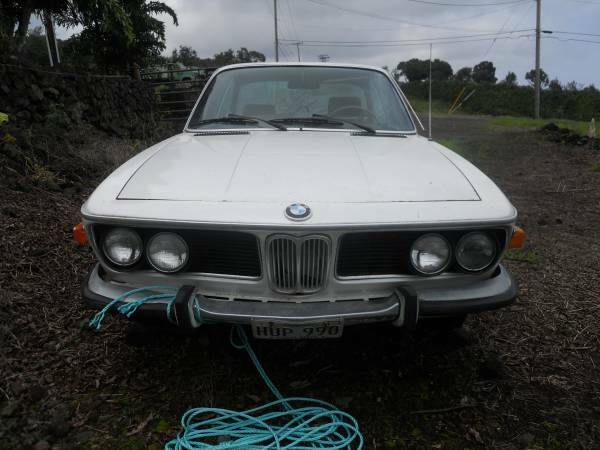 Check out this 1971 BMW 2800CS for sale for $3000 in Kailua Kona, HI. There’s surprisingly no visible perforation, though there are also no close-up shots. It would be interesting to know when this car made its move to the islands. Confusingly, the seller says the car is not running, and immediately thereafter, that the engine and transmission are okay. Perhaps that’s meant to say the starter has failed, or that it cranks but won’t start due to fuel or spark issues. Either way, the seller calls it a restoration project, but it does come with a fresh set of Michelin tires. Fortunately, it’s a manual transmission car. 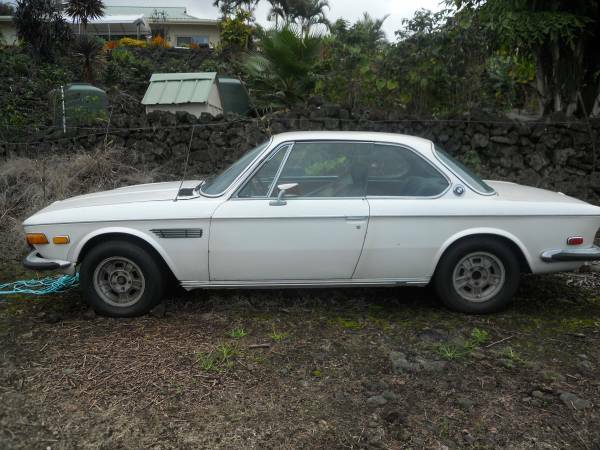 It looks quite complete too, with apparently straight panels, all trim and badging present, and Hawaii plates, though it’s hard to see whether it’s currently registered. Fortunately, it still has the appealing original-spec alloys, though some steel wheels and hubcaps would give it a cool base-model feel. Even in these pictures, though, the paint looks a bit thin, so is likely to be something less than the original Chamonix white finish. The interior is said to be in bad shape. Depending on how bad the rust is, and it’s probably not great based on the car’s location, the most fun with this car might be sorting out the mechanical issue and basically running it until it collapses or can’t be made to pass its next safety inspection. Then, part it out and send the remnants off to benefit other island cars or return it to the mainland. 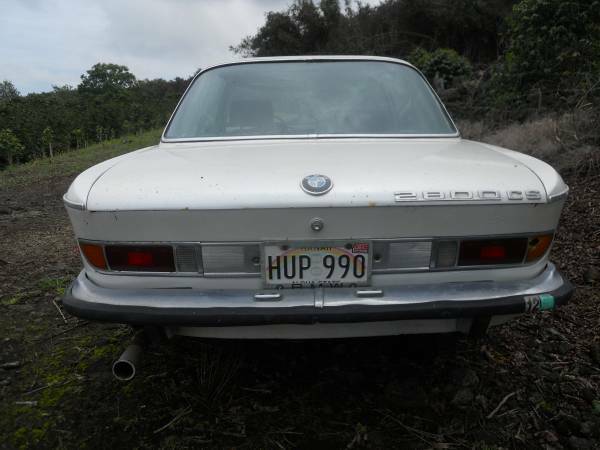 How many other E9s could there be on the Big Island, or in all of Hawaii? This entry was posted on October 7, 2014 at 4:53 pm and is filed under Bad Ideas, Feature. You can follow any responses to this entry through the RSS 2.0 feed. You can leave a response, or trackback from your own site. I live in Santa Cruz California and had it shipped. Picked it up at the port in San Diego and trucked it home. It was such a crazy hassle to get over here haha. I just happen to have a awesome girlfriend who lived on the island so she arranged the paper work and towing.My father had a 3.0 CSI when i was a child that was twin turboed. The car helped spark my love for cars and racing. I grew up in the car and when he sold it in 1994 I was devastated. I was 8 years old and I vowed I would have one for myself one day. I began my search in 2006. 20 years old and working for a motorcycle shop I realized I better save my lunch money cause even then they were going for more then I had stashed in my old helmet bag haha. After a few crazy girlfriends and a jr life crisis I buckled down and made it happen. The car was a score in my eyes and my peers. All original accept for the paint. I even found the service records dating back to 1975 from Monterey BMW which was a dealership 25 minutes from where I grew up. Fresh plugs, oil, rotor and cap, an XR50 auxiliary fuel tank and she fired rite up. I adjusted the timing and she ran amazing….. My plans are to ground up restore it but re build and re use as much of the original car as possible. Few period correct performance upgrades with BBS wheels just like my fathers. I will keep you updated. That’s a great story. If you have pics or are writing up your work in a forum, let me know and I’ll post or link them.